Here’s the latest on the iPad craze for pilots. I love ’em. But there’s a hitch. What happens when the applications purchased by pilots fail? En mass? That’s just occurred in the US. Dozens of flights were delayed apparently due to a digital failure that took out the filed flight plans. Pilots use what’s known as plates for instrument or IFR aviation which used to be purchased as hard copies only. Now these approach plates and others are available for download on iPad which is great. The Jeppesen plates weight quite a few kilogrammes. Commercial pilots may not fly without these important documents. While many still have copies of Jeppesen files in their flight bags, most have converted to carrying the nifty pad instead. But you also use them to file flight plans which then are uploaded via the cloud. We all do that now. This has created a dependency and a lack of redundancy – two things we should be most wary about as pilots. 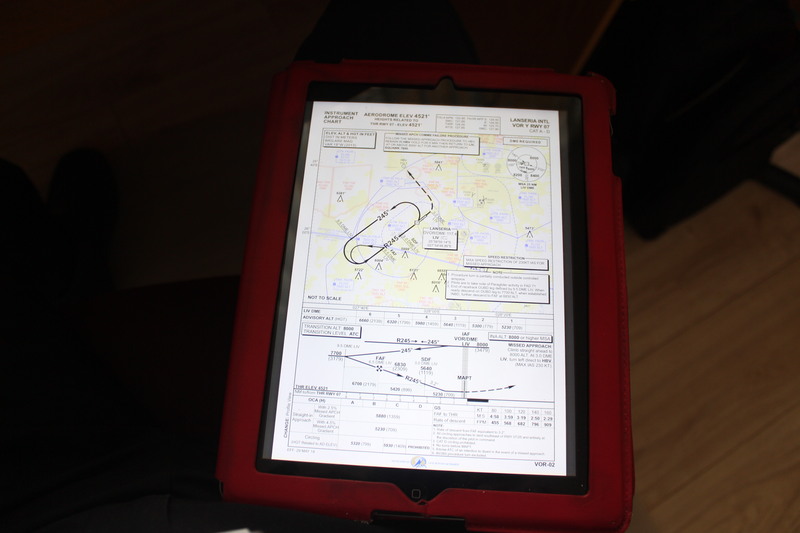 Most pilots don’t print out hard copies of these plans – they just load them straight onto their iPads. It’s being reported that “several dozen” flights in the US have been affected as iPads shut down automatically in various cockpits. Quartz reports from direct sources indicating the outage last night was widespread. Pilots on board various flights in Dallas, New York and Chicago also reported their iPads crashed. The software that powers their pads are used by South Africans too – its Jeppesen. I was training on instruments two nights ago using the iPad on board ZS-BOR with instructor, Steve Wide. But in my case it was not the flight plan on the pad, just the charts. I’ve loaded a picture of what they look like alongside. We use File2fly in South Africa in order to file flight plans which is a very effective on-line tool. These can then be printed out featuring the course, speed and so on making it easy and quick. The downside is when there’s a power failure – or the cloud breaks down. This entry was posted in Uncategorized and tagged aviation, Chicago, Cirrus SR 20, Dallas, IFR, Instrument flying, iPad, Jeppesen, New York, Quartz, SR20 by desmondlatham. Bookmark the permalink.